It was an initial whiff of injustice—a gay man wrongly imprisoned for defending himself—that sparked Toronto-based theatre artist Johnnie Walker into action. The playwright spent years investigating a complex criminal case and processing his findings into a new play, Shove It Down My Throat, now playing at Toronto’s Buddies in Bad Times Theatre. True Crime is a genre that has seen a surge in popularity in recent years. Podcasts like Serial, Atlanta Monster, and CBC’s own Someone Knows Something, all roughly follow the same formula of unpacking a historical crime and examining it from multiple angles in hopes of drawing new and interesting conclusions. Shove It Down My Throat borrows heavily from that formula but Walker puts a spin on it by examining his subject through a queer lens. On New Year’s Eve 2013, a 19-year-old man named Luke O’Donovan was arrested after a knife fight at a house party in Atlanta, Georgia. Though several men were involved in the fight, O’Donovan was the only one incarcerated. While witness accounts finger O’Donovan as the instigator, Luke claims he was the victim of a queer-bashing and fought back in self defense. Walker became obsessed with O’Donovan’s case; conducting extensive online research, taking a trip down to Atlanta to visit the scene of the crime and interview O’Donovan’s friends, and eventually, meeting face-to-face with O’Donovan himself. Walker is obviously very passionate about the subject and with his extensive research he has assembled the elements of a potentially fascinating show that gets off to a promising start but I don’t think he quite sticks the landing. Walker takes a decidedly meta approach in his exploration: the first act takes place in the dressing room at Buddies. 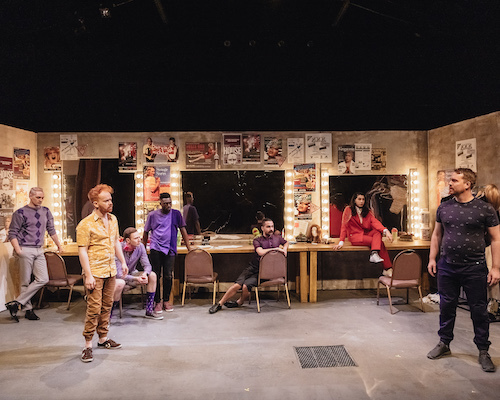 As Walker prepares to present his play he is joined by six unnamed, vaguely supernatural personas and together they form a sort of gay Scooby-Doo, Mystery Inc. gang as they discuss, debate, and re-enact both the O’Donovan case itself as well as the broader cultural context around it. Walker’s perspective on the case remains the driving narrative and he effectively builds the intrigue around the O’Donovan’s story as he explores the different perspectives behind the events of that fateful night. However, after intermission the show starts to lose the plot, both figuratively and literally, as we delve into an extended fantasy sequence that’s meant to further obfuscate the events but feels meandering and a bit arty. I found the pace tended to drag in the second act and the show never recovered the sense of urgency it had in the first act. Ultimately, I just didn’t find myself drawn in to O’Donovan’s story to the degree that Walker was. However, I think there is a taut, compelling 90-minute one act play in there somewhere and some editing to improve the flow and clarity of the ideas would really bring a tighter focus to the play and make it pop.